Weekly family meetings – your lifeboat! Have your kids plunged into the sea of school yet? Do the homework, sports, music lessons…. all feel like huge waves crashing onto the shores of your once calm, summer life? Today’s blog is a lifeboat to help you stay afloat. Maybe after you read this you’ll be inspired to ride those narly waves and find some grace and connection with your kids. The lifeboat I’m talking about is a weekly family meeting. Yes, the family meeting is THE single, most powerful Positive Discipline tool. During parent coaching and classes, I’m often asked, “How old should children be for family meetings?” The answer is, as young as 3 and as old as 30! Seriously. I know someone who started family meetings after all of their kids were grown and married. The meetings transformed the dynamic of their family and created the space for profound love and healing. 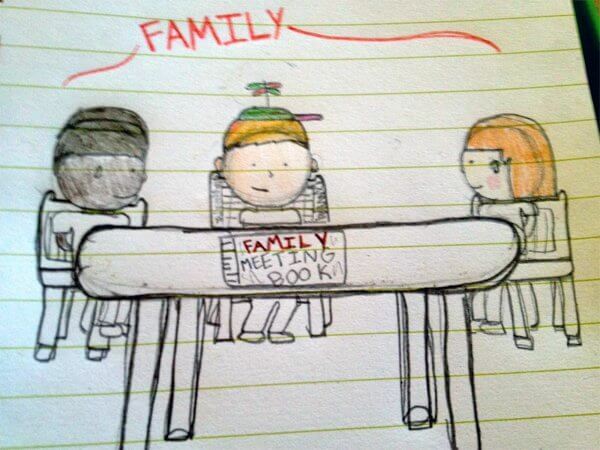 Truth be told, my kids don’t exactly clamor for family meetings. Sometimes my kids complain, resist or try to rush through them. So the meetings are imperfect and messy . But that is precisely the point. The impact is felt by our commitment to make the meeting happen, not by their being done right (whatever that means). What: Call it a family meeting, forum, council, rendezvous, whatever suits you. Have your kids make up a name for this special time (10 to 40 minutes, depending on what’s on the docket and what comes up in the moment). When: Once a week. Pick Sunday evenings and make it part of the routine. If you miss a week or two, don’t throw in the towel. Simply start up again. Where: Usually at home but my family has held them in the car during road trips or even while out to dinner. Why: This is an opportunity to teach and practice Positive Discipline parenting, such as routines, encouragement, follow through, responsibility, leadership, communication, listening, empathy, patience, problem solving and SO MUCH MORE. Each family member feels an increased sense of significance and belonging within the family. In the long-term, family meetings create connection and unity. How: Always start with a round of compliments given by all, to all (don’t forget to include yourself!). Other topics could be problem solving, meal, trip or family fun planning. Be flexible but always include appreciations. See? It’s not so bad! In fact, it’s awesome! For more on Family Meetings sign up here to get a free download of my super duper parenting tip sheet, “Unlock the Power of Family Meetings”. The waves of life will keep on coming but now you are prepared. Inflate the family meeting routine and start floating with intentional, scheduled connection. Family meetings are simple, uniting and powerful. Join me in taking this small but courageous step toward lasting and profound change in your family relationships. Your kids will thank you for it! Now it’s your turn! Remember, your comments remind us that we’re not alone, that we’re part of a community in the toughest job of all. What difference have family meetings made in your life? 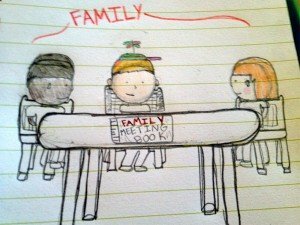 What gets in the way of holding family meetings? Commit to holding 1 this week! 2 Responses to Weekly family meetings – your lifeboat! Your right, it is the perfect time to recommit to this powerful tool. Thank you for making it easier than I thought!